Uncontrolled runoff from barnyards and open lots can contain nutrients and manure. If allowed to enter nearby surface water like streams and ponds, it can cause significant harm. This fact sheet discusses ways to prevent or reduce the possibility that runoff from barnyards and open lots will pollute the surrounding environment. though the lot is polluted. Therefore, if 80 acres of pasture runoff drains through a one- acre lot containing manure, the result is 81 acres of polluted runoff. Even though the runoff is watered down, it is still considered a pollution risk (Figure 1). However, there are ways to reduce the pollution caused by manure and runoff from small barnyards and open lots. Place grass or other plants below the lot where it can filter runoff before reaching streams and ponds. Try to have at least 100 feet of grass between barnyards and surface water. If you follow these six principles, you can reduce the chance that barnyards, wintering areas, or open lots will pollute. Livestock owners can change fencing, divert clean water around lots, regularly collect manure from lots, control manure runoff, manage nutrients, and protect water wells from pollution to reduce the possibility that their farm will pollute and to be a good steward of their land. State and federal regulators and environmental groups look for a connection between where animals are penned and surface water when determining if a farm is polluting or has the potential to pollute the environ- ment. Examples of surface water include streams that contain water only when it rains; streams and rivers that flow year round; and lakes, ponds, and wetlands. Some state regulators may view road ditches or waterways as surface water. enough room for the animals and minimize the area that contributes polluted runoff. This is the first step to decreasing environmental risk. Table 1 can be used to properly size open lots. If buffer space outside a pen is limited, reduce the number of animals in the lot before reducing the pen space. Keeping the same number of animals in a smaller lot may negatively affect animal health and comfort. If grass can be established or if an adequate buffer area is available, the amount of space for each animal may be increased. “Dirty” runoff should filter through grassy areas before reaching ditches, streams, and other surface water. “Clean” water is runoff from crop fields, hay fields, pastures, roofs, or farmsteads. Direct clean water away from the barnyard or open lot. Joe Farmer was rebuilding a wintering lot near the home place and wanted to know how much dry lot space he needed for his 25 beef cows. He uses it to keep cows and calves for four months before turning them out to pasture in the spring. Currently the lot is 170 feet by 170 feet. From Table 1, cows-calves need 500 square feet per pair. The new lot needs to be 170 feet by 74 feet. Joe decided to move his fence back 96 feet and plant the old lot space to brome for a filter treatment system. Separate “clean” water from “dirty” barnyard runoff. Clean water ditches, channels, waterways, and terraces help control the runoff from elevated areas. Direct roof water using gutters (Figure 2). Figure 2. Shed with gutter drainage system. Guttering prevents roof drainage from entering lot. the chance manure will leave the barnyard. Pull-type blades, such as a box scraper or a three point blade, work best to clean lots (Figure 3). Collect manure from barnyards and lots monthly. Figure 3. 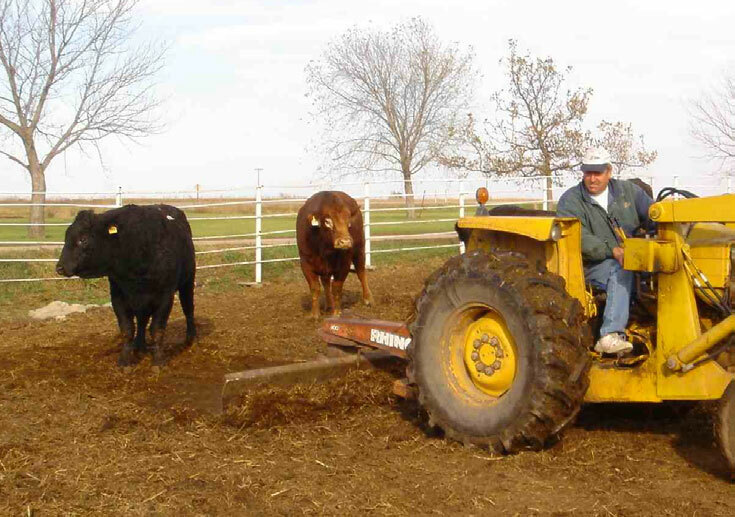 Collecting manure with a pulltype blade works best for maintaining lot surfaces. position wastes feed and reduces body condition. Using concrete or geo-textile fabric around the feeding area eases manure collection. Manure should be stock- piled in locations where run- off will not drain into surface water. Manure can be stock- piled in a field, away from surface water, and spread when it is more convenient. 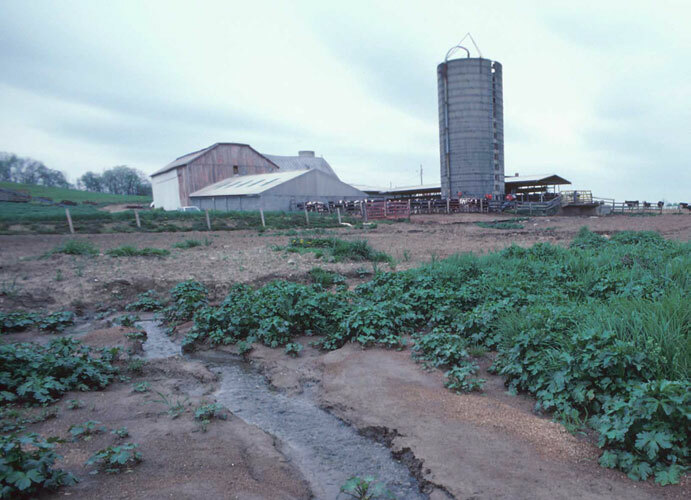 If manure runoff reaches a ditch or stream when it leaves a lot, it pollutes the environ- ment. If runoff from a lot passes through a grass strip before it reaches the ditch or stream, it will be treated. The plants will use the nutrients and excess runoff water. In- stalling a debris basin, filter fence, or similar device provides additional treatment by settling manure solids before the liquids flow through the vegetation. These are called vegetative treatment areas (Figure 4). A rule of thumb is that a vegetative filter or treatment area should be at least as large as the lot area. Rule of thumb: Vegetative filters should be at least as large as the lot area. Figure 4. Vegetative filter using gated pipe to take runoff from a lot to a brome filter. Manure contains valuable nutrients that plants need. If the nutrients are not used, how- ever, they become a pollutant. A ton of chicken manure can contain up to 70 pounds of nitrogen. If commercial fertilizer costs $0.30 per pound of nitrogen, the nitrogen in the ton of chicken manure is worth $21. collected and spread on grass- land or cropland. Otherwise, the manure is wasted. Loamy and sandy soils and shallow groundwater indicate areas that are easily polluted. Both water wells and wellheads should be installed according to state codes and located uphill of livestock feeding areas and runoff water. Apply less manure on loamy and sandy soils that are close to groundwater because they tend to allow liquids to flow easily through them. Stop using cisterns or hand-dug wells located near feeding sites. Properly plug any watering system that is no longer being used (Figure 5). Animals should have a clean and reliable source of drinking water. Letting animals drink in a stream is the same as dump- ing a small amount of their manure in the stream everyday. 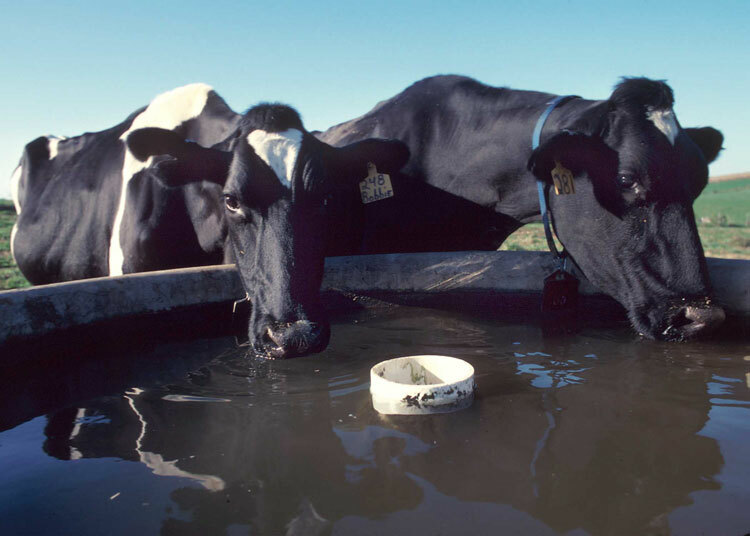 Providing water from a water bowl, water tank, or automatic waterer keeps both the stream and your animals healthy (Figure 6). An alternative solution is to limit your animal’s access to streams or ponds with a watering ramp. Am I Subject to Regulation? with surface water. 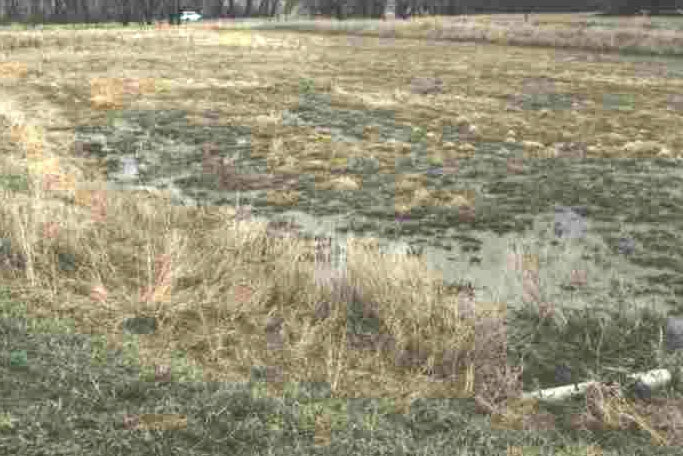 If a small farm has a filter strip, debris basin, holding pond, or infiltration field that prevents runoff from directly flowing to surface water, it will probably not be subject to regulation. However, farms that have a connection to surface water could be required to install controls and obtain permits. 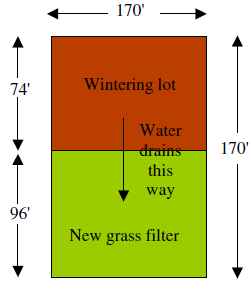 Try to maintain as much grass in and below open lots as possible (Figure 7). The grass helps to filter and use nutrients. It is best to bale and feed this grass rather than let livestock graze on it. Figure 7. A vegetative buffer area below an open lot will filter runoff before it reaches surface water. When am I Regulated by EPA? of operation can be considered a CAFO. To avoid needing a permit, small-scale farmers should manage their farm so that they will not meet the definition of an AFO. To avoid being called an AFO, small farmers may need to manage their lots near crop fields, pastures, and range land differently than in the past. They may need to limit the amount of time that live- stock spend in lots. To be a good steward of the environ- ment, small farmers will need to actively encourage the growth of grass in confined areas and to reduce the chance that runoff will reach surface water. Do animals spend time in any area that does not contain grass or other ground cover? If the area is com- pletely bare and is not used for crops or hay, it may concern regulators. Are animals restricted to the area more than 45 days during the year? Housing animals in lots, wintering areas, and barnyards for a short time does not concern regulators as long as it is temporary. Regulators will thorough- ly inspect lots and areas that are obviously used more than 45 days if they think they are polluting streams, lakes, or wells. A small farm must first be an AFO before it can be considered a CAFO. What is a Small CAFO? Brown-colored water is leaving your lots or barn- yards and noticeably flowing into a stream, lake, or even ground- water. Brown-colored water is leaving your lots or barn- yards in a man-made A pipe has been installed to drain runoff water from the property. polluting. They have sent you a letter asking you to correct the problem. Do not place a pipe or ditch from the barnyard or open lot to surface water. 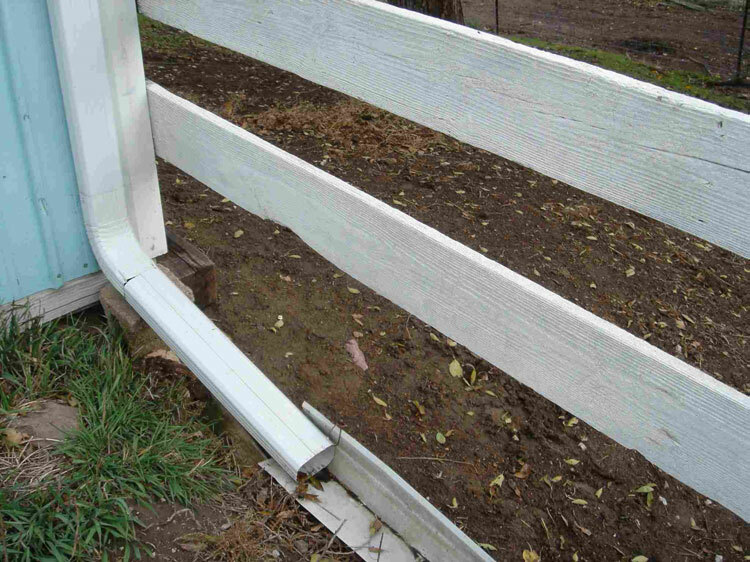 Place a grass buffer or filter strip between your barnyard or open lot. When animals are present, it is best to clean the open lot once a Cleaning lots once a year is not enough. Take steps to prevent extra water from drain- ing into your lot or barnyard from a field. Provide the right amount of lot space for your animals. Avoid a bare open lot that is larger than the animals can use. 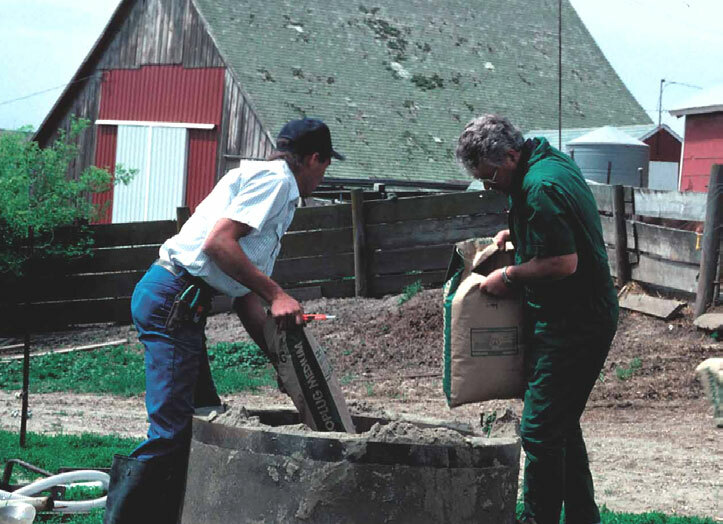 Plan to spread manure to use the nutrients, not just to get rid of it. Do not allow water to collect near wells or wellheads. Fence off streams and ponds next to your Do not allow animals to drink from them. Chris Henry, Extension Engineer, University of Nebraska-Lincoln, can be reached at chenry1@unl.edu or 402-472-6529. Joe Harner, Extension Agricultural Engineer, Kansas State University, can be reached at joe@ksu.edu or 785-532-2930. The authors wish to thank Diane Huntrods, the LPES Project Manager, at MidWest Plan Service, Iowa State University, for editing this fact sheet and coordinating its completion. The authors wish to thank Herschel George, Kansas State University, Robert Frisbee, Kansas State University, and Nancy Swarts, University of Nebraska for their review of this fact sheet.